Prime Minister Sheikh Hasina today said Bangabandhu gave the main declaration of independence and encouraged the freedom-loving people to an armed war through the historic March 7 speech. “Through the speech, Father of the Nation Bangabandhu Sheikh Mujibur Rahman gave the main proclamation of independence and severe all relations with Pakistan,” she said. Sheikh Hasina, also the chairperson of the Father of the Nation Bangabandhu Sheikh Mujibur Rahman Memorial Trust, was presiding over a seminar at Krishibid Institution, Bangladesh Auditorium here this afternoon, according to BSS report. 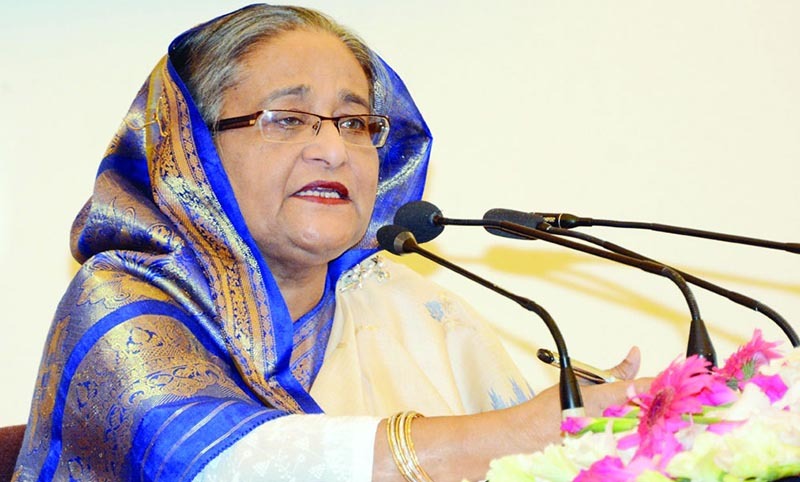 Through the speech, she added, Bangabandhu not only presented an independent country to the nation, he also told that what will be its future,” she said. Sheikh Hasina urged all to take the country forward by following Bangabandhu’s directives and ideology. The Father of the Nation Bangabandhu Sheikh Mujibur Rahman Memorial Trust and the Bangabandhu Memorail Museum jointly organized the seminar titled ” March 7 speech of Father of the Nation Bangabandhu Sheikh Mujibur Rahman: Political Poet and Immortal Poem” on the occasion of the historic March 7. University Grants Commission Chairman Professor Abdul Mannan presented the keynote paper, while Vice Chancellor of Jahangirnagar University Prof Dr Farzana Islam and Associate Professor of Dhaka University’s International Relations Department Dr Niloy Ranjan Biswash and Chairperson of Bangabandhu Memorial Museum Painter Hashem Khan took part in the discussion on the keynote paper. Chief Executive Officer of the Bangabandhu Memorial Museum Mashura Hossain gave the vote of thanks. The prime minister said through the March 7 speech, the Father of the Nation gave all directives to the nation. “He also outlined what Bangalees will have to do,” she said. Sheikh Hasina said Bangabandhu feared that after the speech he may not remain alive and be killed as the Pakistanis made such ill attempts many times. “That’s why Bangabandhu left making all arrangements for war and I’m its silent witness,” she said.